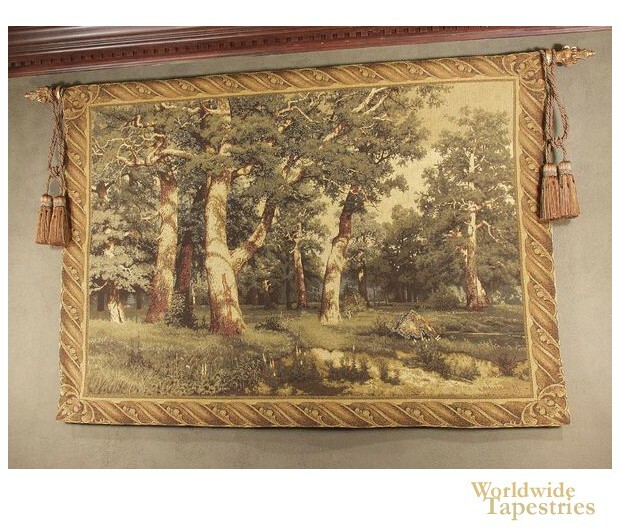 Receptive Woods tapestry shows a glorious scene of the forest and stream. This Belgian tapestry shows superb beauty of design and balance, where this forest scene shows gorgeous detailing in the trunks, foliage and grasses, including the shadows and play of light on the trees. The beauty of rendition of the forest is simply beautiful in this tapestry which takes the verdure to new heights as we see the beauty that a verdure of the forest can bring. Full of wonderful beauty, this Belgian tapestry "Receptive Woods" is backed with a lining and has a tunnel for easy hanging. Note: tapestry rod and tassels, where pictured, are not included in the price. Dimensions: W 73" x H 52"